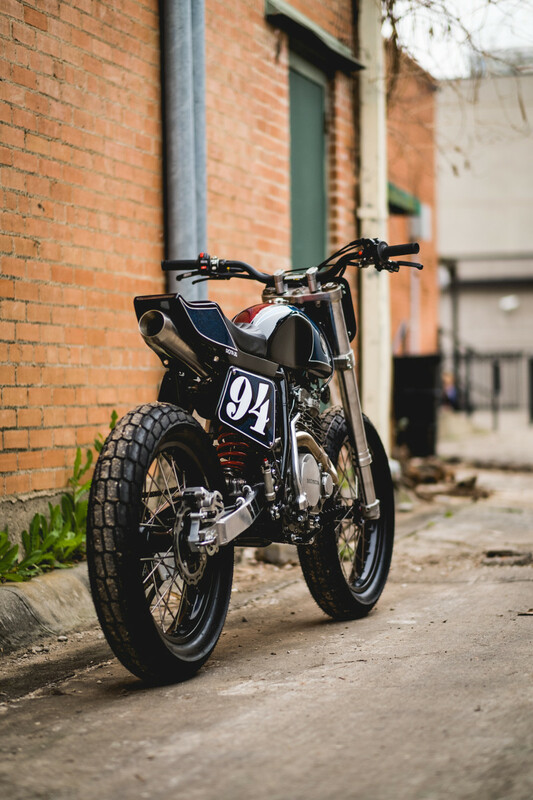 The Honda XR600R — affectionately known as the “Big Red Pig” — was the king of the desert for a decade and more. 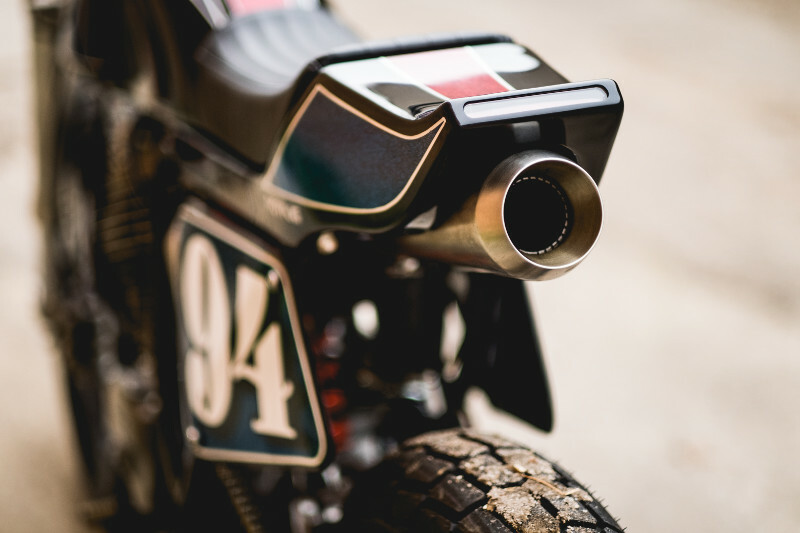 Introduced in 1985, the big air-cooled XR quickly rose to dominance at Baja and beyond, unseating the 500cc two-strokes and maintaining an off-road reign that lasted until the introduction of the liquid-cooled XR650R. 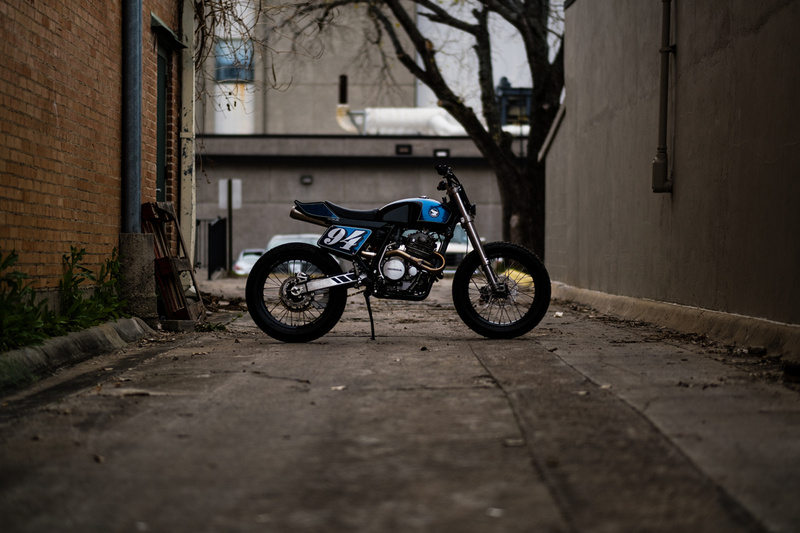 While the bike was never street-legal from the factory, many a savvy owner has managed to plate his XR600R for street use, making for a true dual-sport weapon. Enter JohnGreen, aka JuanVerde of @RotaJG — based in Denton, Texas. 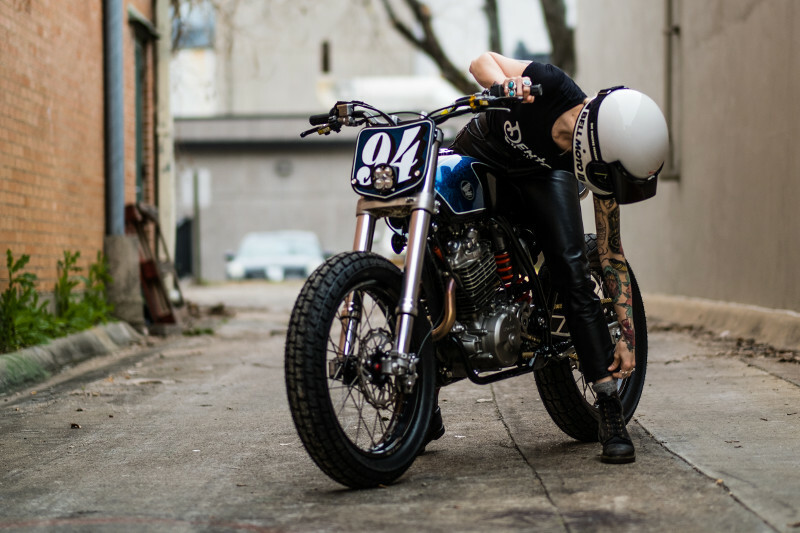 We first met John at Bryan Fuller’s inaugural Forged Invitational — part of Caffeine and Octane at the Beach — where he was displaying this incredible Honda CB750 build. 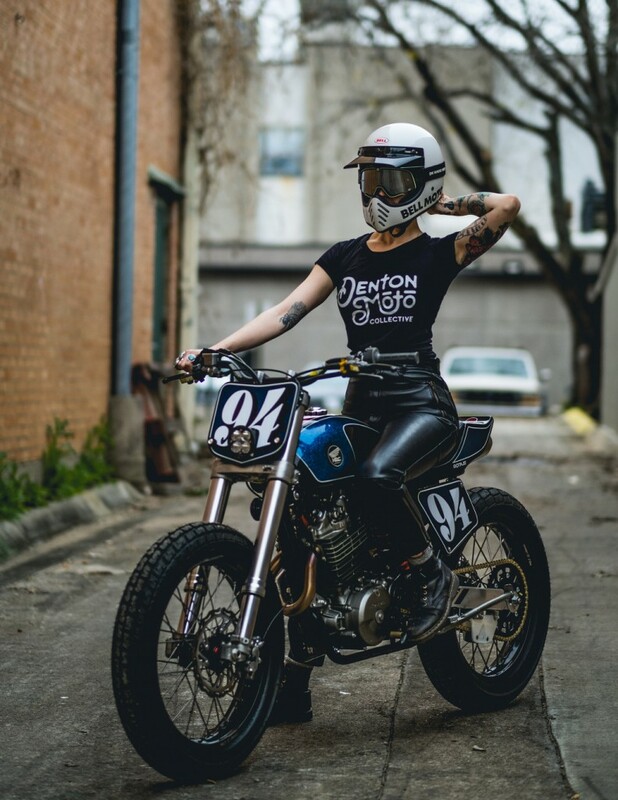 There, we had the pleasure of meeting a whole slew of good people from Denton, including Fabian and David from Denton Moto Collective. 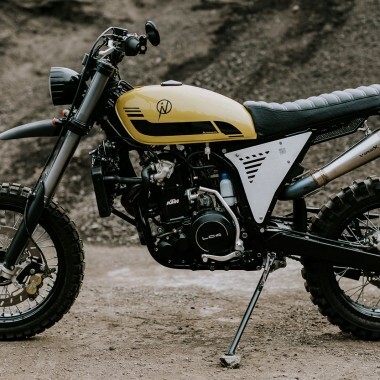 Below, we get the full story on this XR600R “urban street tracker” along with a killer deck of shots from adventure-travel writer/photographer Scott Brown. JohnGreen aka JuanVerde. 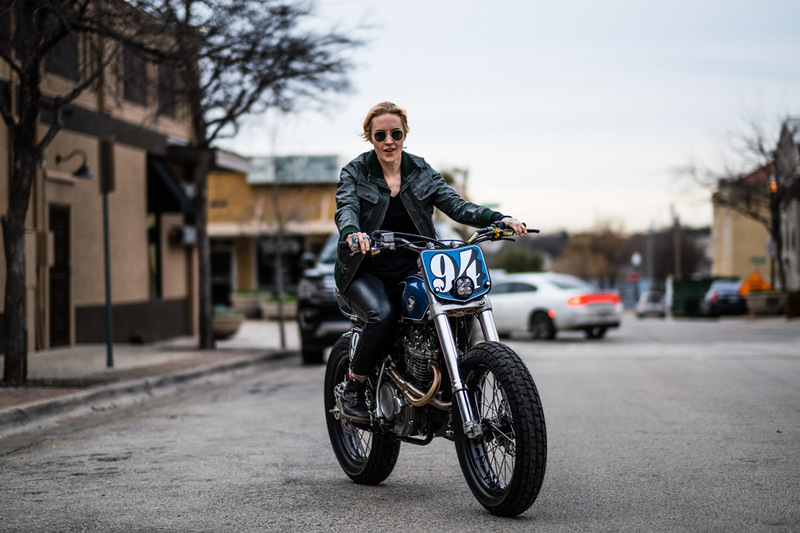 I’m one of those guys that has always been drawn to motorcycles, cars and hotrods. 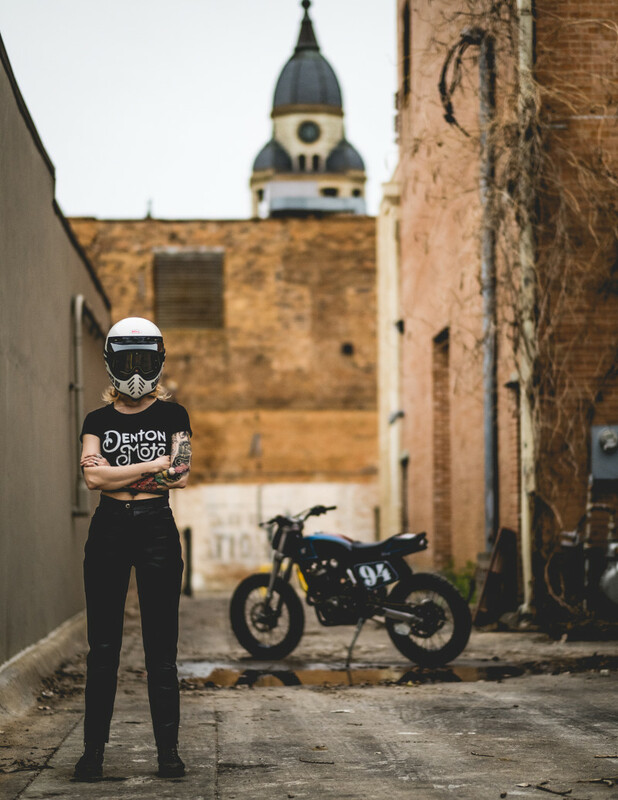 Never had a motorcycle as a kid – it was never an option. Mom was all-powerful and truly scared the snot out of me. Bought my first bike (Suzuki GT750) as soon as I left the nest. I build for fun out of a 30×40 metal building in Denton, Texas that I share with my cantankerous 85 year old pop. He’s an old California hotrod kid, artist, professor, and world-class tinkerer/heckler these days. We have a pretty good assortment of machinery and tools, although we could always use a few more items. 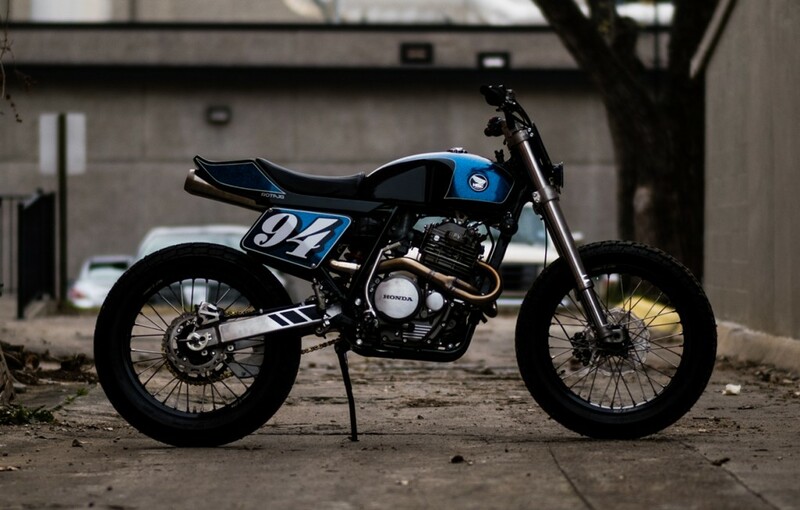 The bike is based off a 1994 Honda XR600R. They are affectionately dubbed big desert pigs by many. I built the bike for fun, and eventually to sell so I can buy some more tools. 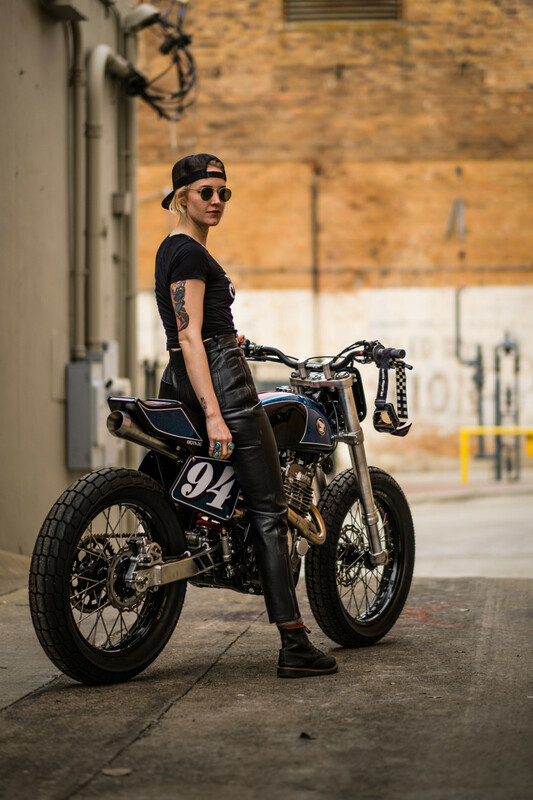 The bike is influenced by any of the 19” flat track bikes, vintage or new, that have made a great comeback over the last several years. Jebus bless RSD and the Hooligan trackers. 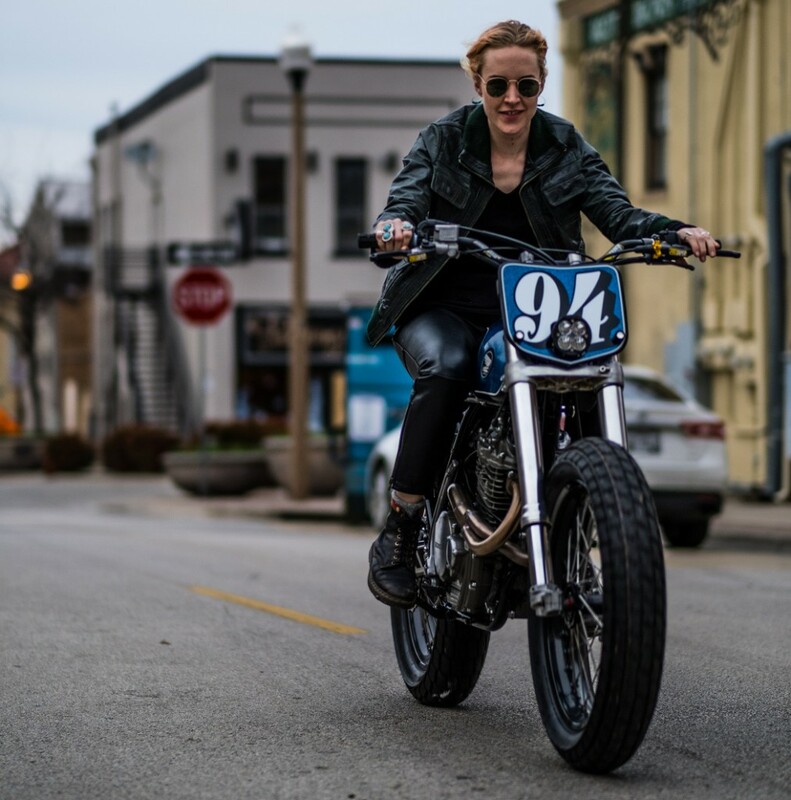 I’m hooked on that genre of racing and the bikes. I’ve always like the simplicity of big thumpers. 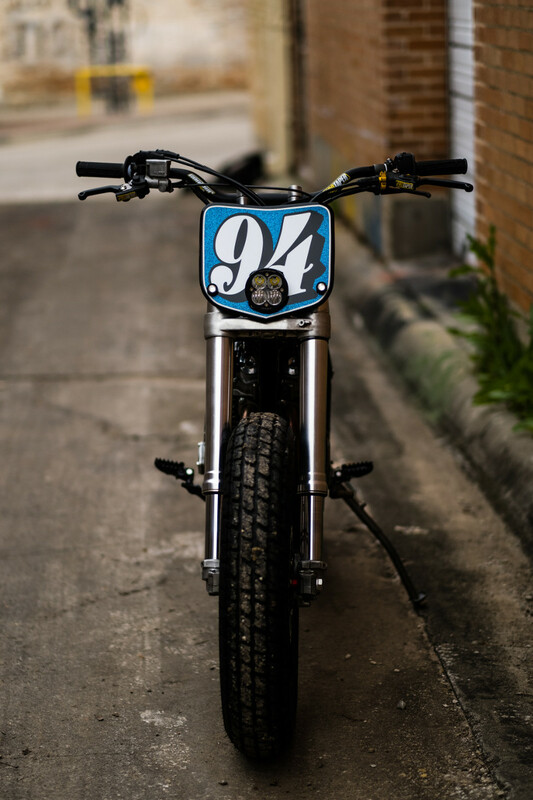 There is just a lightness to an air cooled, oil-in-frame, dirtbike. I tried to keep it as skinny and svelte as I could. 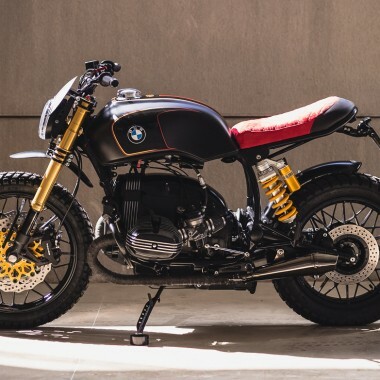 It probably leans more toward an urban street tracker. It’s definitely a rider. There’s not much left of the original. 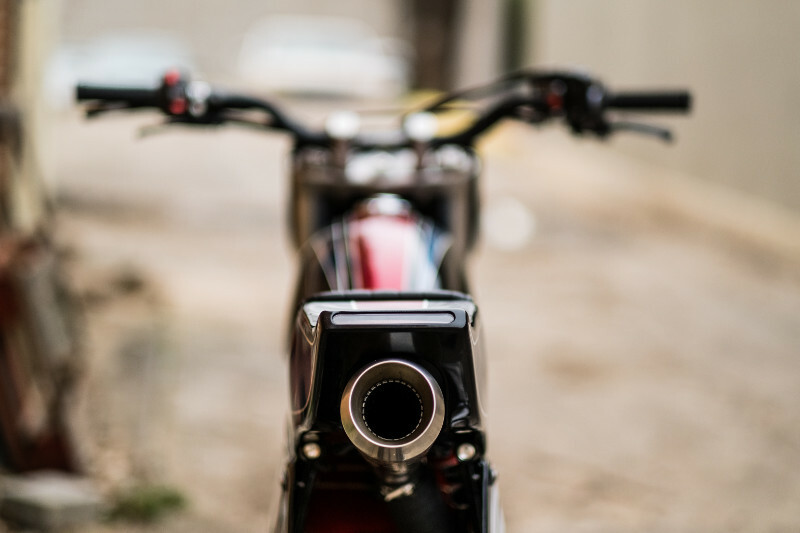 The bike was completely striped down and the rear portion of the frame was removed and replaced with a new subframe using 1” tubing, bent with a torch, that fit more with the proportions of the other frame tubing. 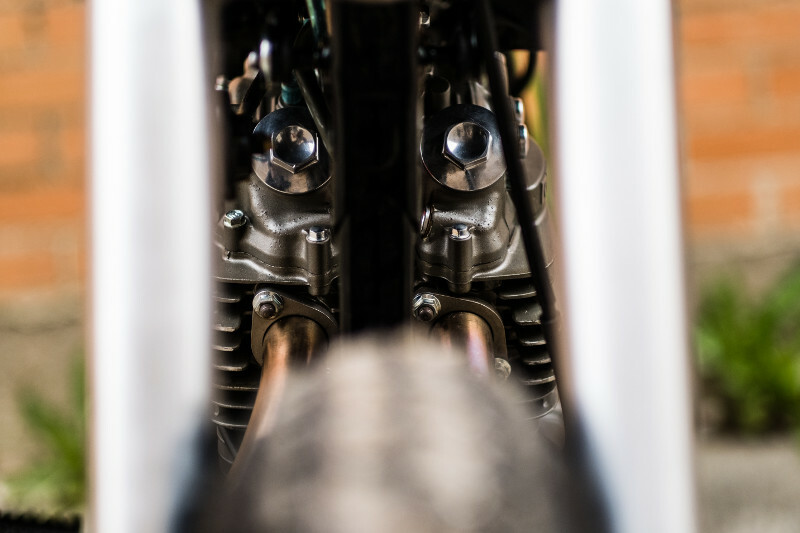 The front end has Showa sliders and triples from a 2007ish CRF250/450. All you really have to do is press the stem out of the XR triples, and make bushings so the XR stem will press back into the CRF triples. The front suspension has been lowered internally a good 6 inches or so. There are 3 machined grooves so you could go 1” lower or 1” higher depending on how you like things set up. While they were apart, I chucked them in the lathe to get rid of the pitting – they looked pretty bad. Both wheels are 2.5” x 19 to get that classic flat-track look. 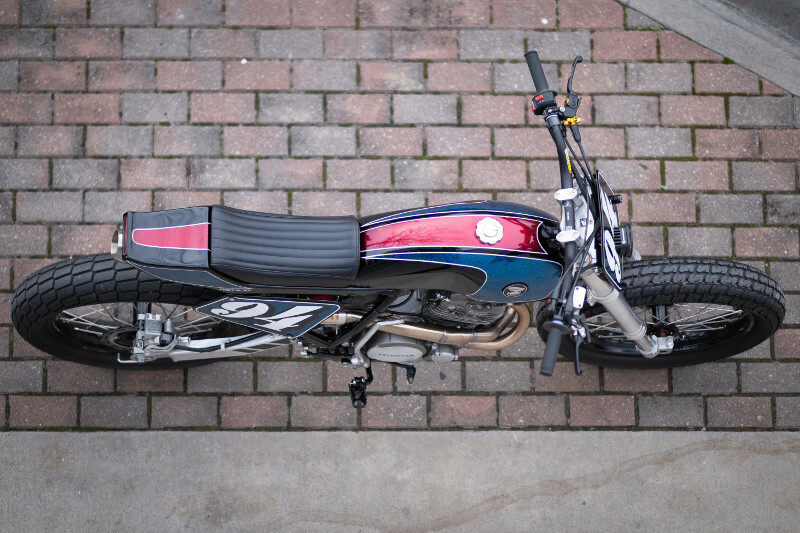 The front uses a CRF 250 hub and the rear uses the XR600R. 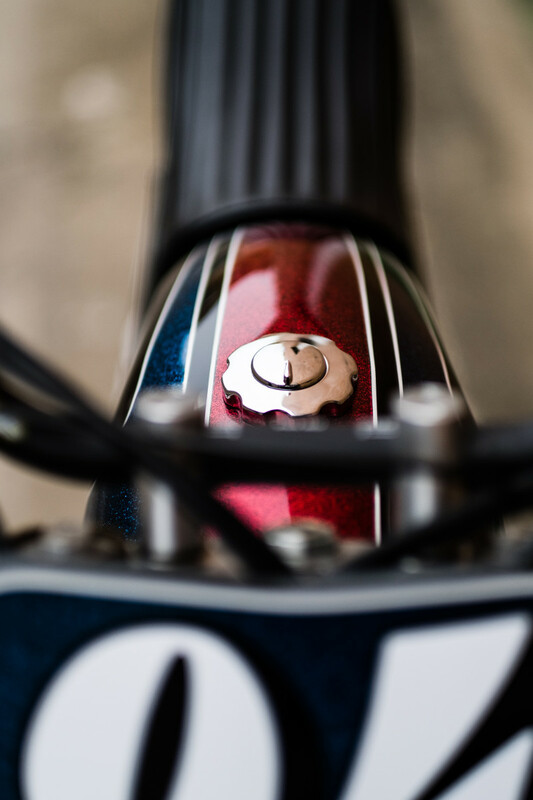 (Easy to use the stock brakes that way) The rear shock was also lowered internally between 2-3” (no lowering link). 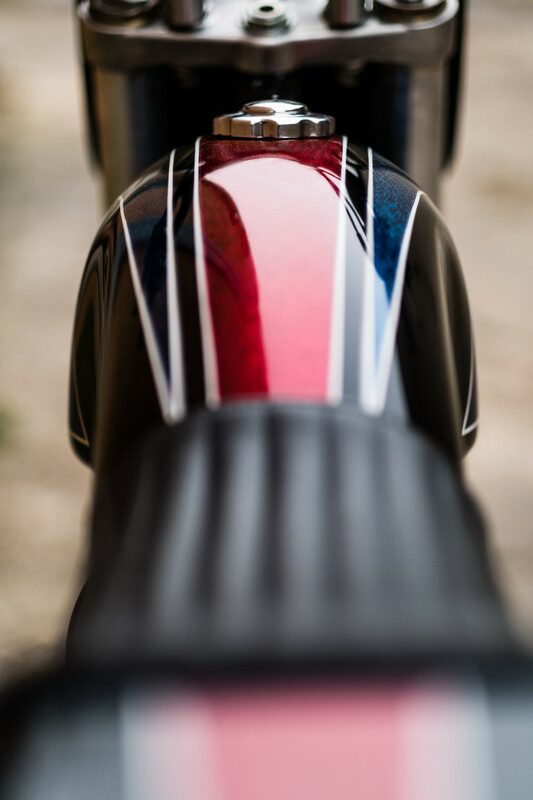 It’s a very comfy bike to ride. The body work is all steel. The tank is a cheap ebay copy of the old Benelli tanks. The bottom tunnel, and some of the front of the tank had to be cut out and reworked so it would fit the frame and mounts. And, more importantly, have that forward lean that it was begging for. 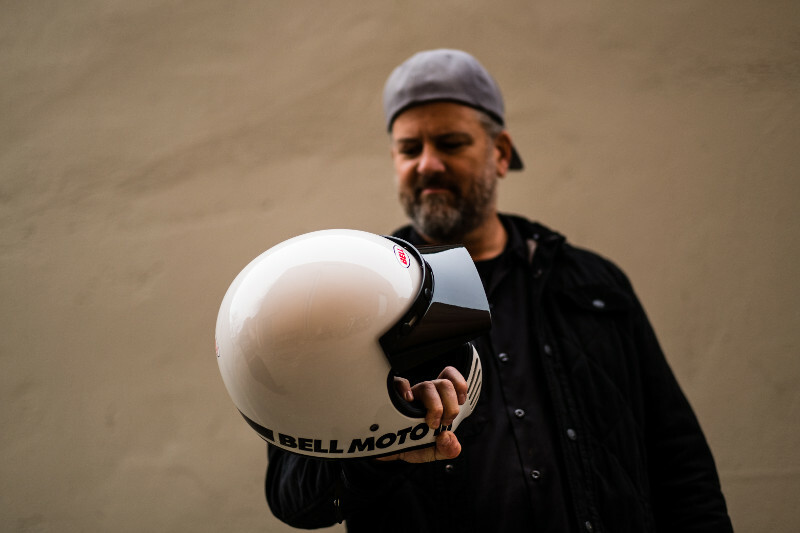 I’m not really a fan of those tanks, but I was over at David’s (Davmomoto / Denton Moto) shop one afternoon — David has a really good collection of tanks, so we threw several on there just to see what things might look like. Still can’t believe how natural the Benelli tank looked on there. Again, I never really liked those tanks. The rear tail section kinda reminds me of the old TZ, or KZ tails of the early 70’s. I formed it using hammers over plywood patterns I made. 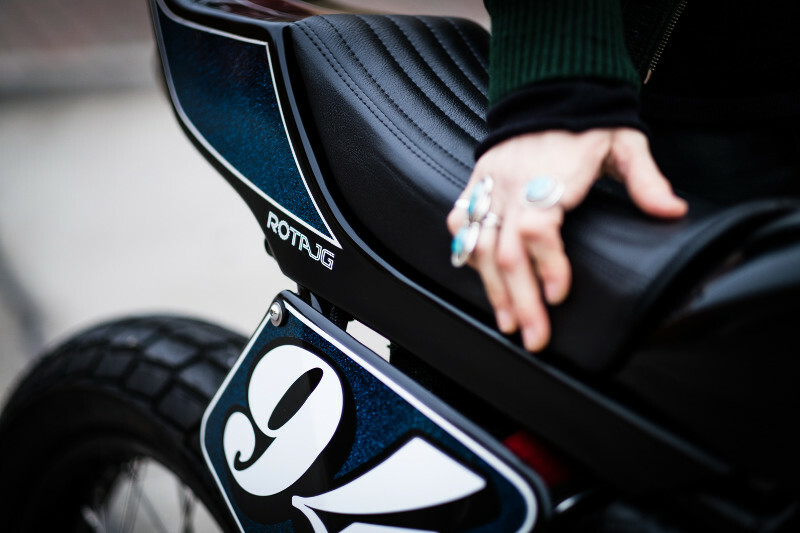 The number plates are also steel, hammered over plywood patterns with bead-rolled edges. Ideally, I wanted to use aluminum, but somehow, I still don’t have a tig welder yet. I do all my paint and body work, since I’m cheap. Truth be told, I really like to do the paint. I tend to stay near the line of “too much” or “too blingy”. I’m like a raccoon – I like shiny stuff. I made a seat pan and molded the foam so my buddy @pennysavage could stitch up a cover for it. Since the previous owner must not heard of motor oil, the entire top end had to be replaced/rebuilt. Somehow, it still ran! It’s bored 2-over and now has a new cam, rocker arms, bearings, forged piston/rings, valve seals etc. etc. By some miracle, the valves and seats weren’t bent or burnt up, so those got re-used and lapped in. Now that I have the hang of it, it’s a 1-kick engine cold or hot. Those big thumpers are so simple. Indestructible. Big pig tractor. The bike is affectionately named Blarth. Darth Vader’s little-known, privateer hooligan, flamboyant twin brother. 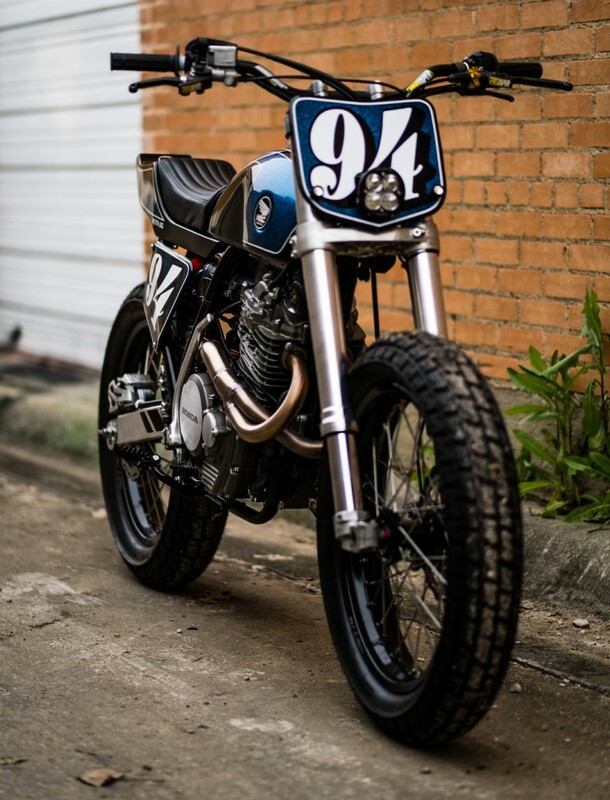 I’d classify this bike as a street tracker/scrambler. I dunno, it’s good on trails and dirt too. As for anything that I’m particularly proud of… I’m more of a visual guy, so I’m pretty proud of the overall look of the thing. Of course, I’m also hard on myself, so when I do another of these, there will be some subtle changes. Thanks again for the feature. We are honored!! Also, gotta love a chick that’s hot can ride. Beauty and the beast, all in one machine – big congrats! Love your modest attitude as much as your enviable skills. I’m using a CB200 tank that I bought cheap to practice shaping on, but it looked right and stayed on. I hope you got funding for your tools, especially a TIG – for the next big pig?